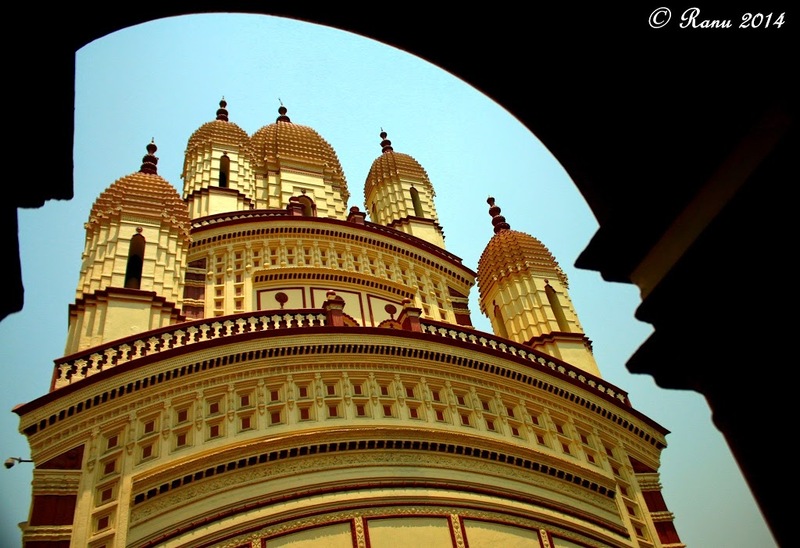 For me….. Dakshineshwar Temple is one the most beautiful temple in the world. Not because it is a vital part of my childhood but also because it is for me the beginnings of my belief in the Almighty. My childhood memories of going to meet my family and grandparents at my native place in Kolkata has always included a trip to the temple. My family is a strong believer of Kali to whom the temple is dedicated. In fact she is our family Goddess and this temple is the epitome of the belief. Going to the temple is actually homecoming for me. All my holidays in Kolkata or for that matter even all trips to the city of Kolkata have never been complete without a visit to Ma. Dakshineshwar temple is dedicated to Ma Bhavatarini. It was built in 1855 by Rani Rashmoni the then Zamindar of Dakshineshwar. The temple is built in the nav-ratna architecture, a Bengal form of architecture. You can see many forms of this architecture in the terracotta temples in Bishnupur and Bankura districts of West Bengal. In Hinduism any Kali or Devi temple cannot be complete without a Shiva temple. Dakshineshwar too is flanked by the 12 Jyotirlinga Shiva Temples and the best part is….. it opens up to the Ganga (or the river Ganges). There is something really peaceful about the Ganga. I am not wildly spiritual but the mere dipping of feet in the Ganga calms you. The bathing ghat at Dakshineshwar is where numerous people take a dip at the Ganga before offering their prayers at the Kali temple. You cant really talk of Dakshineshwar and Ma Kali without mentioning Ramakrishna Paramhansa and Swami Vivekananda. They are almost synonymous. 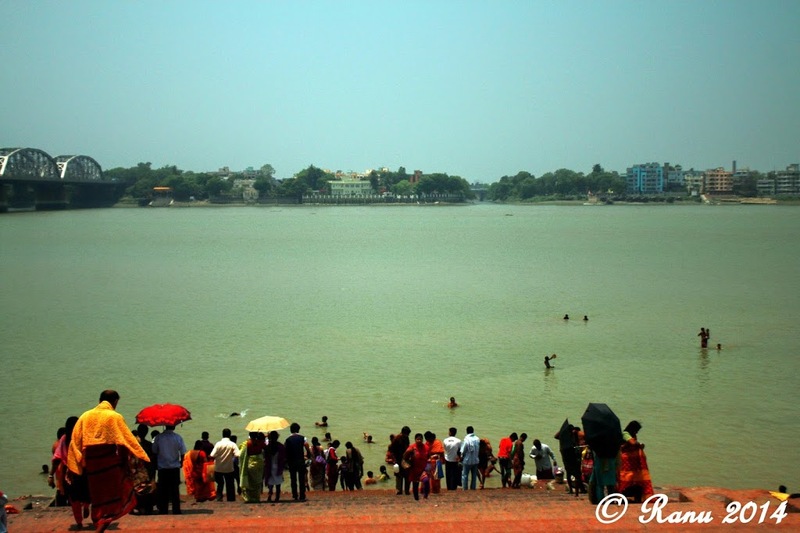 Dakshineshwar was the grounds which helped to Gadai (Ramakrishna) reach heights of spirituality. For me this temple is most peaceful, most cleanest and the most spiritual of all temples. Too many superlatives ehh :D……… but its just the way I feel. These are 6 of the total 12 Shiva Jyotirlinga temples. People taking a dip in the Ganga ghat…… across the Ganga is Belur. When u dig a well, there’s no sign of water until u reach it, only rocks and dirt to move out of the way. Mirabai, the name itself fills me with reverence. It is not just her life and love for Krishna but also her simple poems. They fill you with such awe and tranquility and the love simply emanates from them. Meerabai’s life story is that of riches to rags. Born a princess to her adoring royal parents and married to a king who loved and adored her, her love for Krishna preceded everything. So much that she lived a saint in her palace and then left everything for her love to live with beggars and the poor (a dishonorable act for a queen in her days). She was tortured and banished from the kingdom for the unconditional love for her Lord…… even made to drink poison but her love never left her. It made states and kings to bend their rules and laws. Mirabai redefined LOVE – that love cannot be bound by any boundaries and it surpasses all!!! Love knows no shame no right wrong….. It is sublime. You can read more about her here. This is the temple where Meerabai prayed and served her Krishna. Chittorgarh is her in-laws house. At first she only came down here to pray everyday. Then in the later part of her life she lived and served her Lord right here and then when her husband died, she was banished and wandered all over the country only to return here and it was here that she was given poison. Thousands throng here everyday to get a little piece of Meerabai. I did too!!! When I realised that I was kinda close to Chittorgarh. I changed my whole travel itinerary and drove 100’s of miles to be there. You can’t be in Rajasthan and not meet Meerabai. As I stood before the altar (pic 3) was so enthralled and as I looked for signs and traces for her presence, the peace that dawned on me at that moment was unbelievable. I could sit there all day.